The Brazilian Heavy/Power Metal band HIBRIA was founded back in 1996. It took ’em two demos to put out the debut album, “Defying The Rules” (2004). I heard of a few of those songs on YouTube and honestly, it sounded very much alright. Once the band released its the second album (“The Skull Collectors”, 2008), I started paying attention to them. And that is a very good album, I can assure you. Three years later, album no. 3 comes out: “Blind Ride”. This also was a nice experience, though I must admit I found a bit less attractive compared to the previous release. But it remains a strong album. 2012 sees the release of the live album/DVD “Blinded By Tokyo – Live In Japan”. But more importantly is anno 2013: the release of the band’s fourth studio album, “Silent Revenge”. This came out on the 26th of July via AFM Records, at least the European edition. This edition contains a bonus track, the acoustic version of “Shall I Keep On Burning”. The album also features a guest appearance by singer André Meyer from the Brazilian band DISTRAUGHT (see Metal-Archives.com), a band I’m not familiar with at all. They have so far released five albums. “Silent Revenge” kicks off with the powerful title track. This song has a nice rhythmic, grooving start: just riffing and drums and then… GO! Fast, uptempo Power Metal with, obviously the focus on guitars and drums. Iuri’s high-pitched vocals (incl. screams) and André Meyer’s (DISTRAUGHT) go well with the heaviness of the music, also offer contrast. Overall there’s a nice flow between the different parts (verses, bridge, chorus, …). The chorus is melodic and in a way, hymnic. Up next is “Lonely Fight”. This one sounds tight and direct, but it rocks more, has a Bluesy influence, including the screamy guitar in the beginning. The verses are powerful and fierce. Vocals soar high in the bridge, to maintain the melodic aspect in the straight-forward chorus. The guitarwork stands out here, not only rhythmically, but mainly melodically. “Lonely Fight” is a very energetic track. Time for some fast Power Metal then with “Deadly Vengeance”. It’s a straight-forward song with a typical, pounding, Power Metal bridge going into – like before – a straight-forward, melodic chorus. Halfway the instruments do the talking and everything slows down, leading to an atmospheric, ballad-like break. Just vocals and the keyboards (piano) here. Afterwards, of course, power is restored. Speed is also of the essence in “Walking To Death”, where DISTRAUGHT vocalist André Meyer also makes his appearance. His voice is hoarser than Iuri’s. Musically this song has very tastey riffing. “Silence Will Make You Suffer” is a firm Heavy Metal track. That’s at least how it starts. No sign of heaviness in the atmospheric, clean verses. Even Iuri’s singing is adapted to this. Full, melodic power is unleashed in the chorus. The solo is also good, it’s Bluesy, yet Metal. The obligatory power ballad is then due, to break the tracklist into two: “Shall I Keep On Burning”. It starts acoustically, but later on the electric instrumentation kicks in. It’s quite alright. The fully acoustic version was added as bonus track to the European addition of the album. Contrast, you say? Buckle up for “The Place That You Belong”, for the band has charged its batteries. Heavy verses with screamy vocals. As the recipe prescribes, the chorus must be of the melodic kind (again). A break halfway offers a moment to catch your breath, before carrying on like before. “The Scream Of An Angel” sounded quite old school to me. Almost as if HIBRIA were covering an old Metal tune. But it’s not a cover. It’s another powerful song with a melodic chorus. This part flows well, whereas the verses sound very firm. But on a whole, this is a very accessible song. Last but not least, “The Way It Is”. Ending with a catchy (as most tracks on this album are) is always a good thing, making sure that quality is maintained. It’s also the longest track, with almost 8 and a half minutes of playtime. The music is not fully Metal, more like a mix of Rock and Metal. The guitar solo halfway reminded me of (old) ANGRA. After that, things get more Funky and Groovy. Oh yeah, baby! This track also has enough room for solos, not just the aforementioned ones, but also later this element pops up again, in a more screamy way. Rhythm remains a key ingredient, though. And I can only advise to give this song several spins to let it show all of its contents. What I did find creepy, is the whispering loop at the end of the song. It will have its function, no doubt, but this leaves a black mark (to me) on an otherwise very good song and album. 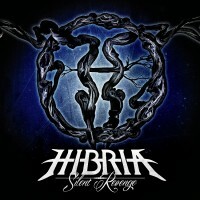 Is “Silent Revenge” HIBRIA’s best album to date? It certainly shows that these Brazilians know their Metal and how to deliver the goods. This should open many (European) gig doors now. Firm, powerful, and qualitative Heavy/Power Metal for any fan of this genre. Oh yes, and a candidate for the Best Of 2013 lists. Without question. The Best of 2013 ! This album is amazing !! !